In the scenic vacation area of Tahoe, California, the Placer County Department of Public Works recently constructed a new intermodal transit center. 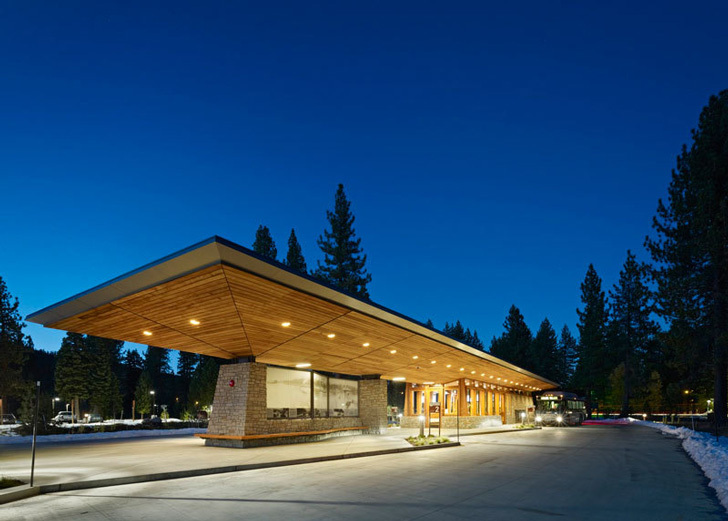 Designed by the team at WRNS Studio, Tahoe City's new transit building provides transfers and parking for the local community, which gets around by walking, biking, driving, busing, and boating. 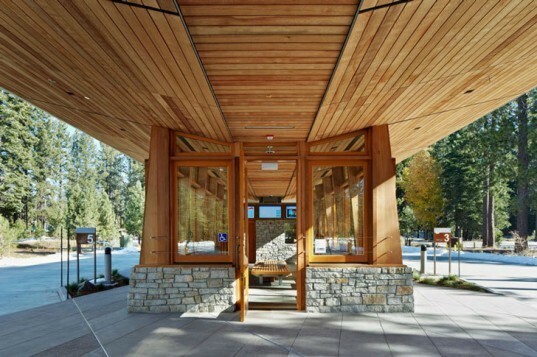 The Tahoe City Transit Center (TCTC) also plays a role as a socially, environmentally, and culturally responsible contemporary landmark for this mountain community. Its rainwater harvesting and passive and active solar design features help to promote green building in an area of California surrounded by pristine wilderness. The TCTC’s shape is indicative of the region’s history with Lake Tahoe. Shaped with curves similar to a boat, this long rectilinear building’s roof eaves have long wooden slats as if designed as a boat deck. Besides the western red cedar slats, other natural material such as the Sierra granite stone walls reflect the “cabin-in-the-woods” style that is prominent throughout most the architecture around Tahoe. Also, native planting and vegetation around the building help to blend the TCTC into the landscape of Tahoe. The programmatic spaces for the TCTC include parking for 130 cars, a bus loop for six regional buses, administrative space, bike parking, restrooms and a meeting room for 40 people. The building’s small footprint is only the first of multiple sustainable efforts that the client undertook with WRNS Studio. The roof is designed to hold 250 pounds-a-foot of snow in order to harvest the snow melt in a 4,000-gallon cistern connected to a rainwater reclamation system for irrigation and toilet flushing. The building also conserves energy through the use of solar cells on the roof, operable windows, and the large roof eaves. The angle of the roof eaves not only provides shadow during the summer months, but it is also designed to bring in direct sunlight during the winter. Three bronze plaques describe the three main sustainable elements of the design: water efficiency, sunlight for power and illumination, and natural ventilation. The building has been recognized as the winner of the Caltrans 2013 Excellence in Transportation Award for Intermodel Transportation, and it continues to impress the design communities around the country. The roof is designed to hold 250 pounds-a-foot of snow in order to harvest the snow melt in a 4,000-gallon cistern connected to a rainwater reclamation system for irrigation and toilet flushing. The programmatic spaces for the TCTC include, but certainly won’t be limited to, parking for 130 cars, a bus loop for six regional buses, administrative space, bike parking, restrooms and a meeting room for 40 people. Besides the western red cedar slats, other natural material such as the Sierra granite stone walls reflect the “cabin-in-the-woods” style that is prominent throughout most the architecture around Tahoe. Shaped with curves similar to a boat, this long rectilinear building’s roof eaves have long wooden slats as if designed as a boat deck. The angle of the roof eaves not only provides shadow during the summer months, but it is also designed to bring in direct sunlight during the winter. Three bronze plaques describe the three main sustainable elements of the design: water efficiency, sunlight for power and illumination, and natural ventilation.